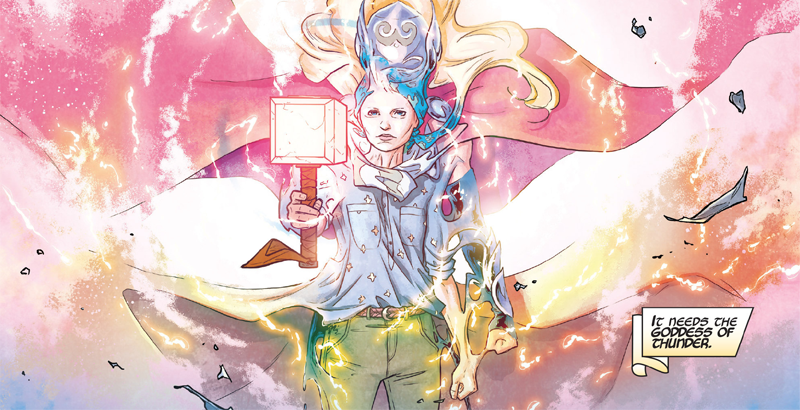 Jane Foster transforms into Thor in Mighty Thor #8. Last week, Jane Foster, Marvel’s Mighty Thor, fought her final battle. As far as we know, she is no more, and a relaunch of the Thor series that will see the Odinson restored as the God of Thunder is coming. It’s a sad time, because Jane’s arrival heralded one of the best continuous runs on a comic in recent Marvel history. The fantastic team of writer Jason Aaron, artist Russell Dauterman, colorist Matt Wilson, and letterer Joe Sabino spent three years guiding Jane’s journey in the pages of Mighty Thor, a continuation of Aaron’s work with Esad Ribic and Ive Svorcina on Thor, God of Thunder, since 2012. In that time, Jane went from struggling cancer patient into the Goddess of Thunder herself, and went on adventures that spanned the Marvel cosmos in vivid, gorgeous ways. She also did it in a way that made Thor as a character—as a series—feel more human than ever before. Jane taking flight in Mighty Thor #1. Part of this is simply down to Jane being the woman she is—strong, confident, always defiant for better or worse (whether she’s facing down Odin or refusing to complete chemo, a progress complicated by the fact her Mjolnir-powered transformations repeatedly purged away her chemotherapy treatments). But it’s also because of how Jane has acted while she has been Thor, liberated by her transformation with her identity kept secret (well, mostly secret). Jane’s Thor lived in a way most Asgardians rarely did, with an earnest yearning for the joys of life, in battle and out of it. There has always been a duality to Thor as a superhero in Marvel’s vast mythos, whether it’s the Odinson, Jane, or myriad other characters who have wielded the hammer in decades upon decades of comics. The character is torn between two worlds: the divine realm of Asgard, and the realm of Midgard, Earth. This connection can be sometimes played for laughs—a bumbling, musclebound warrior who talks like a Medieval Times employee walking among these quaint little mortals—but in almost every version of Thor, the point of being placed between these two realms, between gods and humankind, is to show the need for both, for a faith in the good of both, despite vast differences between them. Jane encapsulates that on a literal and spiritual level throughout Mighty Thor, not just because of the dichotomy between her failing human body and her all-powerful goddess form, but because of the crises of faith that have tested her throughout her long relationship with the Odinson and into her time as Thor herself. You don’t cross the Goddess of Thunder. Faith has long been an integral part of the story Aaron has told ever since he began on Thor, God of Thunder, three years before Jane’s version of Thor came into the picture. Faith in himself is what drives a surprisingly self-doubting Odinson in the first arc of God of Thunder; in Original Sin, the loss of it—haunted by the words of Nick Fury and Gorr, the God Butcher—is what breaks him so thoroughly that he is no longer able to wield Mjolnir, relinquishing the weapon to a then-unknown woman. Faith is what has driven Jane Foster throughout her time in Mighty Thor. Faith that she can beat her cancer as a mortal, rather than by invoking the privilege of knowing literal gods. Faith in herself that she could be the God of Thunder, even as mortals and gods alike resented her existence. Faith that she was even doing the right thing, not just by being Thor but by holding on to her human side, even as it deteriorated, never giving in to the temptation to just hold on to Mjolnir forever and remain healthy, heroic, and a god. That faith has come to the fore again in Jane’s final adventure as Thor, aptly titled The Death of Mighty Thor. The Mangog, an ancient creature so powerful it can (and does) tear through Asgard murdering god after god, returns to endanger every last Asgardian, just as Jane finds herself confronted by her friends with an ultimatum: If she doesn’t stick to her cancer treatments, if she purges the chemo by transforming into Thor one last time, she will die. In Mighty Thor #704, there’s a moment that flashes back to a rarely-remembered time in Jane’s life, when she had an ex-husband and son, killed in a car accident. The Odinson (then the God of Thunder) comes down to console her, only to be rebuked. What good are gods, Jane rails, if they can’t be there to save people? What good is faith if it goes unanswered? A dark time in Jane’s past, as seen in The Mighty Thor #704. Jane could’ve sat in her hospital bed, got treatment, and lived as Asgard burned. Odin certainly didn’t care for her. Asgard at large regularly looked down on both Thor, the supposed usurper of Mjolnir, and Jane, ambassador to the council of realms. When she chooses to sacrifice herself by transforming into Thor one last time, the Mangog demands to know why she would throw two lives away—a goddess’ and a human’s—to fight it, on behalf of gods that don’t care for her. Her answer is faith: faith in herself, faith in her friends, faith in the people she’s loved. And that’s worth fighting for, even in the hard times, even when it’s tested by people who aren’t always there for you. For one last time, Jane Foster fights for love in The Mighty Thor #705. There’s a point to the fact that Jane Foster died fighting a threat to all of Asgard instead of in a hospital bed, a proud and strong woman wasted away by an awful disease. That commitment to a cause so just—whether it was helping people as a doctor, or helping gods across the realms as Thor—never left her, even in her darkest of moments, to the point she was willing to give everything to defend it. It’s why, even as the mantle of Thor returns to Odinson, I will always remember the times when Jane Foster was the Goddess of Thunder.